Beginning tomorrow (or anytime you stumble upon this post) We will be hitting the journal trail…there is no minimum word requirement. Some may fill many pages, some may write a few thoughts that amount to a paragraph. Some might only write a Bible verse or two, wetting the pages with their tears. This is not Journal Boot Camp. This is Journal Your Journey with Jesus. Before we set out on the journey, there are a few things I am going to ask of you. The first is only that you be sure and keep first things first. Trust me when I tell you, we are all good at complicating things beyond what we need. For this journey, I ask you to travel light. You need paper, pen and Bible. Your paper will be provided by the journal of your choosing. Use whatever pen suits you. You may use the Bible (s) of your choice. That is all you need for the journey, besides your heart. Of course the heart is where it can get complicated. Your mission if you choose to accept it? To meet with this One God. To learn to SIT quietly in His presence. To listen to Him through His Word, To listen to Him through prayer, To listen to Him by pondering His Word (not your To Do List, or list of gripes etc), To listen to Him by meditating on Scripture, To learn to discern His voice above the noise of your ceasless striving. This is why I write: To hear Him. Writing engages all of me, physically, mentally…it connects me and helps me clarify what I think, and what God is saying to me. It allows for my emotions…that can get pretty scribbly! I tend to talk to God and write as well as do both intermittently. But, I don’t want to get ahead of myself…just whet your appetite. The first step of this journey is to make sure you have the three elements you need for the journey. Bible, Journal, Pen. Next, you will consecrate this journal. To consecrate simply means to set apart or dedicate something to a sacred purpose. Your sacred purpose is knowing, believing, trusting and obeying Jesus. That is a pretty high calling. Lucky for you, what He starts, He finishes. BUT, He needs you to set apart time for Him, with Him. Our journals will be the place of our daily connecting with Jesus working out all of these mentioned aspirations. He is the Living Word and able to reveal Himself to you in deeply personal ways that will help you know Him better. He has provided all you need for knowing Him in His Word and Spirit. He is interested and interceding for YOU to God the Father. 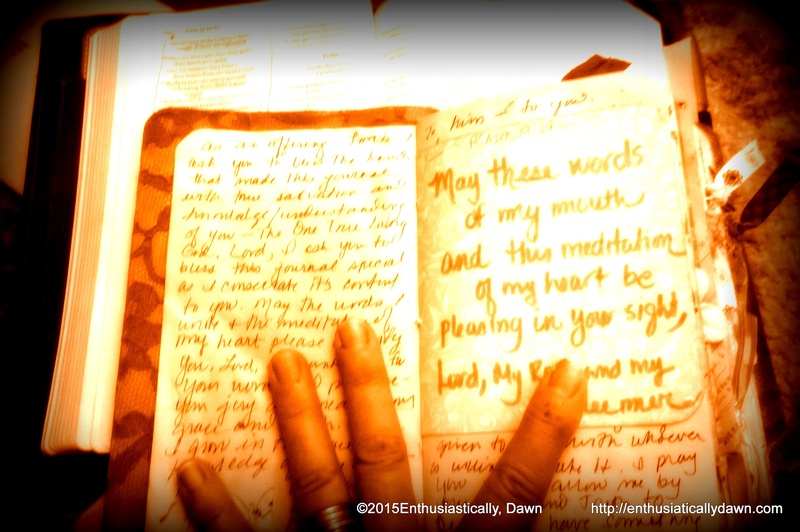 How do you consecrate your journal? Well, I could tell you to light a candle, dance around the Bible, or soak yourself 14 times in the tub, bow down and pray 40 Hail Marys, sprinkle the journal with holy water or something else very specific. BUT, is all you need to do, is come to the Lord in prayer and begin with a humble heart and ready pen. Simply (re) commit yourself and set apart your journal for the sake of knowing your Savior better. God had already brought to my mind a certain verse (a few actually, but one especially emerged strong), and then affirmed it through my Pastor’s teaching on the specific verse this very morning! I will NOT be posting every single day for this journey…unless God leads me to. The goal is not that you get hooked on coming to me or this blog for your spiritual direction, but that if I can encourage you to connect with Jesus more consistently and that you grow in the grace and knowledge of Him…are set ablaze for His word and glory,well then, I will know I have fulfilled my purpose. Meanwhile, I promise I WILL be sure and give you enough direction, to keep you going on this 40 day journey for the days when I do not post. Lord, I do praise You, my Lord, Rock and Redeemer. You set Your face like a flint and in doing so set the world free – may the words of our mouths and mediations of our hearts be pleasing to You. Bless each one with renewed passion for You and especially Your Word during this Journey. I ask this In the name of Jesus. Amen. Just beautiful! Getting ready to watch A.D. Here in central California! Of course I will. You are the lovely one. Grateful for you. AND your precious family. The last few days have been a whirlwind of FUN – and we ARE allowed to have fun once in a while!! I had gotten behind in the daily devotions I was following in the Upper Room; but took the time yesterday to read before going to babysit my grandchildren…and, you won’t believe the verse?! Psalm 19:14 was the psalm I read along with my Upper Room scripture that was Ecclesiastes 3:1-8!! Thank you for being our guide (with a little “g”), leading us to our Guide! !